grains | Izzy have you eaten? It was so lovely to see the B family after a couple of years. We’d not even met the youngest member of the family, all of two years old. He strode into the house in his little overalls and threw himself down at Alice and Paisley who were quite taken aback, roused from their doggie dreams. It has been a while since anyone paid them such close attention! Baby’s older brother, now bloomed into a charming (and good looking!) eleven year old, kept a tender eye on his new sibling. We knew Mr. B as a young bachelor, tooling around in his black Beemer convertible, and he was a funny uncle to you girls, always laughing and making naughty jokes. It is so nice to see him with his own two children, and his beautiful wife who does a tremendous job taking her wild husband in her capable stride. I hope you have an opportunity to catch up with them while they are in Melbourne. They’d love to see you. I think the last time you saw them was in London, and that must be a while ago now. I made a freekeh salad to accompany a slow cooked lamb dish when they were here, and a crunchy green bean and bell pepper salad. Tonight I’ve cooked some farro. Stirring in some pomegranate seeds, baby tomatoes, chopped parsley, garlic, lemon juice and lots of olive oil. 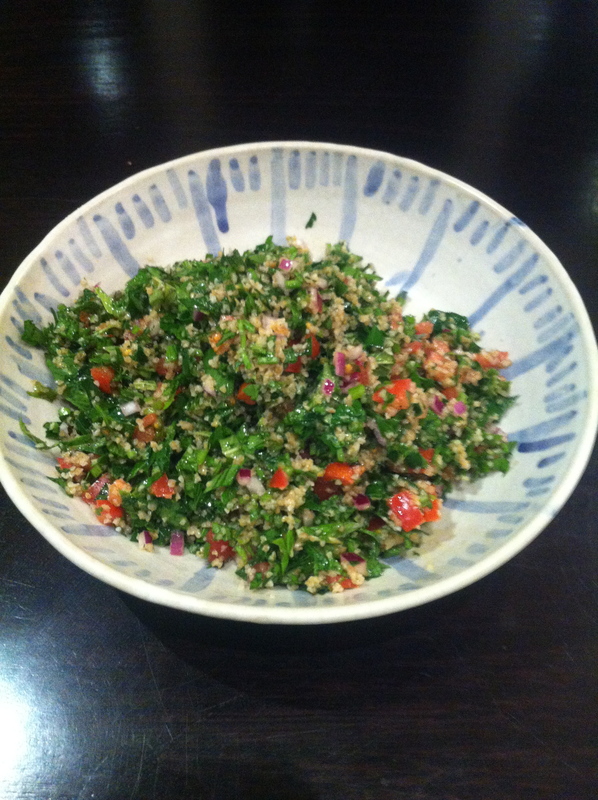 About a week ago, it was some tabbouleh with bulgur to go with spicy lamb kebabs. I love using these different grains- they feel so healthy and the texture is so earthy after rice and pasta. 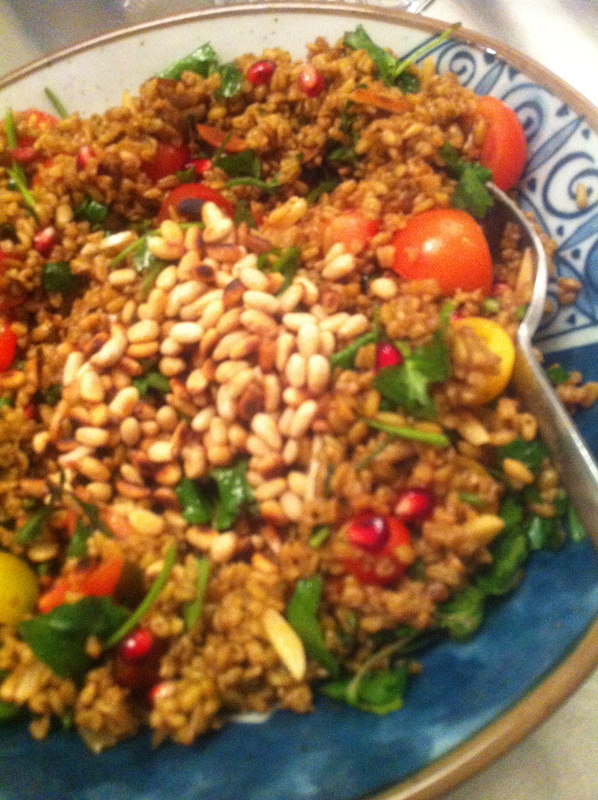 The nutty flavour of farro is hard to beat for me, and I love the colour- a deep green-y brown; so rich and appealing. 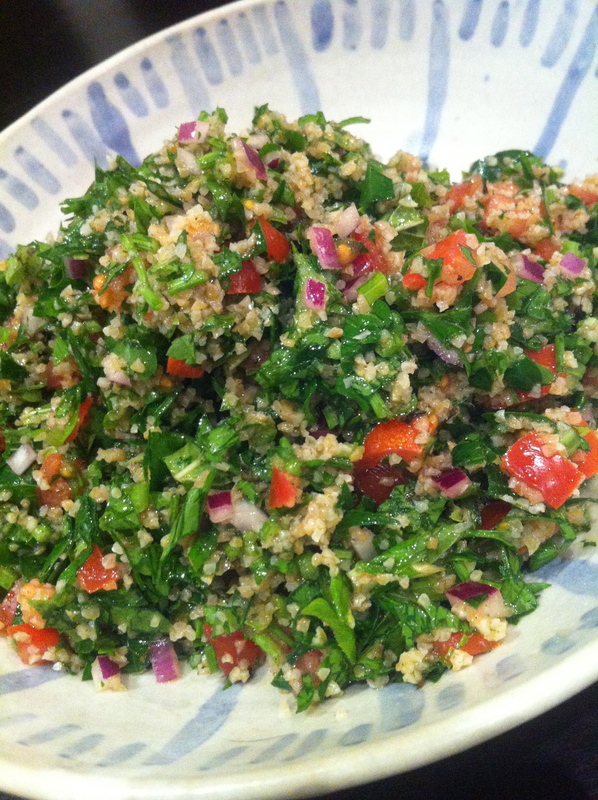 Tabbouleh, with bulgur is so much more economical assembled at home. My jaw dropped at the market the other day when a lady picked up a tub of tabbouleh and the guy said cheerily: Nine dollars please! Ouch! You can make it for a fraction of that. Place the bulgur in a sieve, and wash under cold water. Drain well and put in the salad bowl. 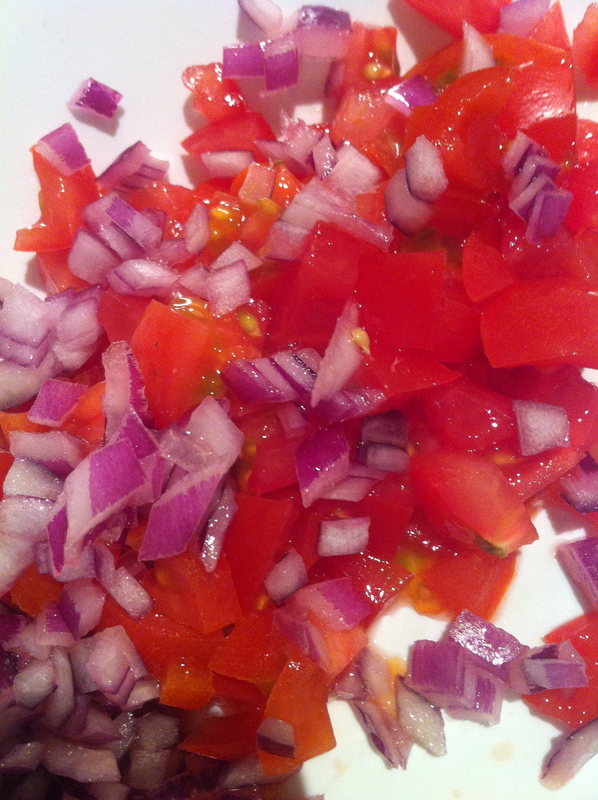 Add the chopped tomatoes and onions to the bowl with some of the lemon juice and stir to combine. Chop off the main parts of the parsley stems and discard. Gather the bunches of leaves together, and chop fine. Add to the bowl. Now the same with the mint leaves, but no stems at all. Add the spices, and olive oil and rest of the lemon juice, and toss all the ingredients thoroughly. You might need a little more olive oil. Parsley is so good for you too! Full of anti-oxidants and high in Vitamin C, can you think of anything better during flu season? Sending you both hugs.